How flattered I am to be ‘consulted’ by my pal Adria Vasil over at Ecoholic about getting your seedlings started for the upcoming season! There are certainly many more experts out there with greater knowledge than I, but to build on the story in this week’s NOW magazine, here are some additional tips and tricks. Do I need grow lights? No. 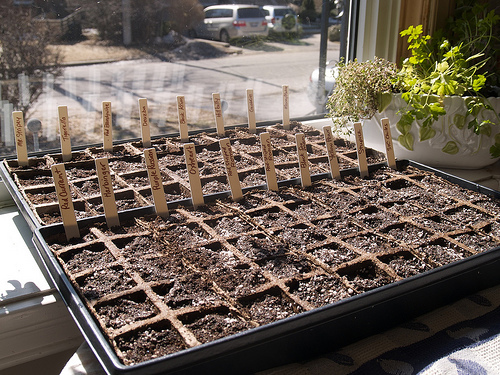 If you have a bright sunny window, ideally south or southwest facing, you can start your seedlings on the windowsill. Grow lights are great, if you have the space and money to invest. I bought a large stand from Lee Valley a few years ago, and while they’re great, I really wish I’d gone for the system that had four lights in each fixture instead of two. The light intensity would be stronger and I think my seedlings would grow less leggy and spindly as a result. In my case, I’ve moved my grow light system into my basement, for space reasons. But my basement is cold, so last year I bought heat mats to ensure the seedlings get the warmth they need for germination. Warning — heat mats make your seedlings dry out super fast! You must be diligent with your attention and watering if you use them. I’ve put my grow lights and heat mats on a timer, which makes it very easy to control the power you’re using and to give your little seedlings the rest they need overnight, like they would get outdoors. What kinds of seeds start well indoors? You can start almost any kind of seedling indoors, but in my experience some types of plants work better than others. Tomatoes and peppers are best to start indoors because they require more time to reach to maturity, so its a good idea to have strong, sturdy plants by the time the frost-free date rolls around (traditionally May 24th in my zone here in Toronto, Ontario, but typically it can often be safe to get plants in the ground even earlier, if you’re watchful of the cool weather). A lot of people like to grow onions and other veg like zucchinis and squash from seed indoors, but I feel this is an unnecessary headache. Most types of squash and cucumbers don’t like being moved as seedlings as their young root systems are extremely sensitive. They do just fine being planted directly outdoors as per the date usually recommended on the package. Onions I usually grow from sets (small onion bulbs); I’ve found that onions from seeds are so tiny and sensitive that I don’t get good-sized bulbs by the time they should be harvested. I’ve even left them in the ground for the rest of the summer and fall, and over the winter to try to get bigger bulbs the next year (yes, onions are capable of overwintering in the garden). When it comes to herbs, I’ve had a mixed experience. In the end I’d rather invest the $2 to $3 in a well established plant from the nursery rather to spend 6-8 weeks of caring for a plant that may not do well in the end. Basil is the only herb that I usually will give a chance to from seed. Cooler weather crops like most lettuces, spinach, chards and radishes can go right into the ground as soon as it’s soft enough to work. They thrive in cooler weather, and are typically harvested before the mid-summer heat, when they tend to bolt. Other veg like beets and peas can go in after all risk of frost has passed. Each variety has it’s own preferences however so pay attention to the recommendations from the seed’s producer. When it comes to gardening, experience is really the best teacher. Trial and error is how I’ve come to learn what works and what doesn’t. Despite years of having a garden in the city, I still find myself overcrowding my plants and by mid-July my heirloom tomatoes are a wild, tangled jungle of vines, bamboo stakes and twine. All the same, it’s helpful to plot out the space you have and how to make it work for you. When you plant your lettuces and spinach, be sure to leave room for your tomatoes and peppers, which will go in the ground much later. Think about what could take the place of your lettuces and spinach when they’re done in early to mid June. Maybe you’ve got some potted herbs that can go in that spot for the rest of the season. Or maybe you’ll plant some fall crops like kale and chard a little later on in the late summer/early fall. It boggles my mind that stores like Canadian Tire and Home Depot offer up garlic for planting in the spring among their gardening offerings. A beginner gardener would naturally assume that if the garlic is available in the spring, it should be planted in the spring, no? No. Garlic needs to go in the ground in the autumn — it’s a crop that overwinters and is harvested usually in July. Don’t be tempted by the heads of garlic available in shops in the spring. In my experience they don’t survive the summer stored in my house, and are useless dried up things by fall. Instead, order your garlic from a reputable grower who will ship it in the fall. There is a wondrous selection of amazing garlic available out there to be grown. I like to shop for mine from Richters Herbs, and I’ve found a great guide to growing garlic in Ontario over at www.garlicfarm.ca. Heirloom tomatoes have become hugely popular in recent years; not that surprising given that Canadians have been subject to the horribly nasty, mealy things that grace most of our supermarket stands most of the year. Heirloom tomatoes are incredibly tasty, and come in all shapes, sizes and colours. I’ve grown a number of varieties over the years, and a few have become my favourites. Yellow Pear (the tear-drop sized yellow one pictured above) is a salad variety that’s low in acid and very pretty, as well as profusely productive. A single plant will happily yield more than enough for a family. It’s fruits usually begin to ripen by late early August. Stupice is a very old Czech variety that I like to grow because it’s usually an early producer, and the first of the season. It’s a smaller, sized red tomato, pictured above in the lower right corner. Black Sea Man is a spectacular looking tomato, with its greenish-purple-black hues and bulbous shape. This is one of the most flavourful slicing tomatoes I’ve tried (pictured above, mostly in the top right of the photo). It’s not the most bountiful producer but the flavour is worth the effort. Goldie, the giant fat orange tomato in the photo, is a very late variety that often requires time ripening off the vine, but it is a stunning, HUGE fruit that looks gorgeous on a platter drizzled with olive oil and basil. Finally, Red-Striped Roman is a unique plum variety that seems to grow well and produce a good yield of saucing tomatoes. Most heirloom tomatoes are indeterminate vines. This is an important thing to know depending on your gardening space. Indeterminate vines are just that — vines that keep growing and growing and growing. They yield fruit that ripens continuously over a span of time. 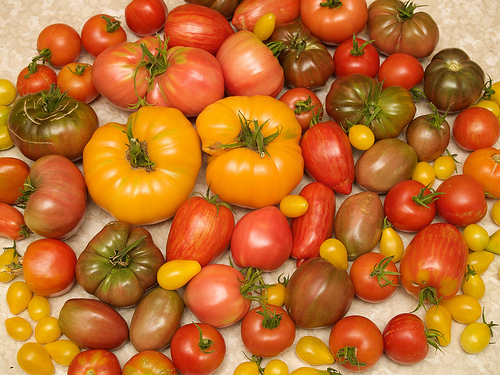 By contrast, a lot of hybridized tomato varieties are determinate vines, which are typically more compact and produce fruit that all ripens at the same time. These varieties are often great for growing in large pots, or in tiny garden plots, as they’re a lot easier to maintain in small spaces, and don’t typically get as tall or require as much staking. I often trim back the vines on my tomatoes when the season gets a bit long in the tooth so that I can access the fruits that are hidden behind a cacophony of vines, but also so that the sun can get at those fruits to help ensure they ripen. Trimming can encourage even more growth when you don’t want it, but I just keep cutting back. Tomatoes are pretty forgiving once they establish themselves. What they won’t forgive however, is a lack of heat and light. That’s lots for you to chew on for now. I’m happy to try to answer questions or point towards more resources… happy sowing! 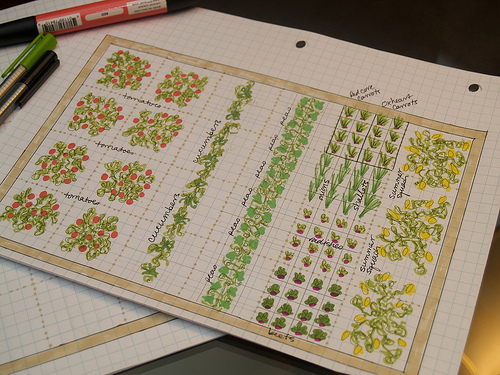 Such a great post Sarah, Great advice about the tomatoes, and what a beautiful drawing…. Aww thanks Larissa! Congrats on your new biz too!